Once a gritty district populated with brothels, the “Triangle of Ballesta” (aka triBall) – so named for the shape that the streets of Gran Vía, Corredera Baja de San Pablo, and Fuencarral form around the main Calle Ballesta – has become the Spanish capital’s latest avant-garde epicenter. Shop-owners like Beatriz Tabara, who opened a clothing boutique-combo-café last fall called Scarly, epitomize the hood’s enterprising vibe. “Everyone has their own story,” says Tabara of triBall’s business owners. “But many of them are professionals who took the leap to make their hobbies a way of life.” Tabara, also a full-time attorney, reveals some favorite spots in the emerging barrio. Where to Eat: Newcomer Mui just opened its doors in January, but it’s perpetually packed. The restaurant peddles classic small plates – ham croquetas, patatas bravas, Spanish tortillas – in a casual space reminiscent of the type of no-frills tapas bars that are slowly disappearing from the Madrid landscape. Tabara suggests heading there at lunchtime, so you can people watch – and nosh on Galician oysters and charcuterie plates piled with Iberian ham and truffled mortadella. Where to Shop: Aside from checking out Tabara’s store, which stocks under-the-radar French labels alongside her own creations, like two-toned ballet flats, she recommends a stop at Dolores Promesas. The designer – best known for her My Ten Commandments line of tees that make such cheeky proclamations in Spanish as “Never covet a garment without my signature” – sells tops and cocktail dresses festooned with funky pop art designs. Her high-end frocks have even been spotted at the Goya Awards, Spain’s version of the Oscars. A trio of libation-loving amigos opened Santamaría, la Cockteleria de al Lado, a bar housed in a once-derelict brothel that’s now outfitted with vintage lamps, flea market finds, and paintings by contemporary Spanish artist Jorge Diezma. Head bartender, Daniel Verdú, mixes all manner of cocktails, including kitschy Mai Tais and dry martinis. But Tabara prefers to grab a seat at the antique wooden bar and sip a mojito on steamy Spanish nights. 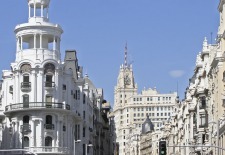 See our Madrid Travel Guide for more trip-planning information, then use our Travel Search price comparison tool to find the lowest rates on flights, hotels, packages, and more travel deals.